Below is an excerpt from Harry’s blog during May of 2017. I was a victim of dementia cyber bullying. 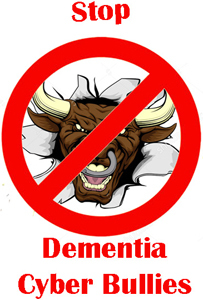 I allowed these dementia bullies to drive me from a Facebook group I founded called Forget Me Not, and stopped me from writing My Thoughts on Dementia with their vicious feeding frenzies. They see themselves as activists and viciously attacked me verbally simply because they did not agree with my thoughts. They steer you to the edge of a cliff, then push you off. They are slowly quieting people living with dementia so they can tell you how they think we feel. They want to be the dementia experts without paying their dues of living a single day with dementia. They are nothing but dementia cyber bullies and need to be exposed. Starting today, I plan on continuing writing and posting My Thoughts on Dementia and creating my “Bully Board” where I will post the names of the dementia cyber bullies that have a need to feed off of me. We need to stop these self-righteous people that get their kicks out of attacking people living with dementia simply because they are speaking out.